I recently saw an advert in the Brussels Metro offering 6 months of free membership of the Villo! cycle share scheme. At the time of writing this offer is valid for the next 3 weeks (until the end of September 2014), but may be repeated. Villo! is the communal hire bike scheme in Brussels with the bikes with the yellow mud guards (same idea as Velib in Paris or the Barclays Bikes in London). There are two components to the Villo! system – a subscription (lasting a day, a month, or a year), and the cost of each bicycle hire – first 30 mins free, then 50 cents per 30 minutes thereafter. The current offer gives you a free subscription for 6 months, but the charges for each individual hire period remain unchanged. The small catch is that you need a STIB MOBIB card in order to qualify for the free 6 months subscription. MOBIB is the smart ticketing system for the Brussels public transport – same as Oyster in London or Navigo in Paris. Even if you are an occasional visitor to Brussels it is worth getting a MOBIB card (basic version) as it saves you 50 cents when you buy a single Metro, Bus or Tram ticket, or €1.50 when you buy a 10 journey ticket. You also get through the barriers at Metro stations more quickly than with a paper ticket. You can get this card from any STIB Bootik or Kiosk – you find these in the major Metro stations. The final step is to associate your MOBIB card with your Villo subscription. You need to sign up for Villo! online here, choosing the 6 month subscription offer and adding this to a MOBIB card. The sign up form allows you to say that you live in Belgium, Luxembourg, France, UK, Germany, Spain or Netherlands (not sure why only those, and this seems like discrimination under EU Law), and you will receive all the confirmation information by e-mail. Note that you do not have to enter your MOBIB card number in this process – the final step of the connection between MOBIB and Villo! is done at a Villo! station, using a code that you receive by e-mail (this is the only part of the process that is not obvious). As a final step, get the AllBikesNow app on your smart phone so you can see where there are bikes, and where there are spaces, and off you go! Brussels MOBIB Public Transport Villo! Does any one know how long the session closing time is? I.e. if I take one bike, return it in 25 minutes, do my shopping and then come back to pick up another bike, how much time has to pass between my dropping off the previous bike and taking out a new one to re-start the timing count? The world’s two largest outdoor advertising companies, JC Decaux and Clearchannel, operate the majority of Europe’s public bike sharing schemes. 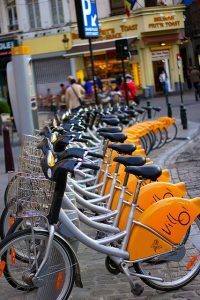 It seems that they have have managed to offer the right service to municipalities at the right time: just when first and second generation bike sharing schemes were failing these companies offered a more secure system with up-to-date automated electronic subscription and locking mechanism. And even better: the system was “free” and the advertising companies were able to roll it out within a year or two. What’s better than a “green” mobility offer for citizens implemented for free with visible results before re-election? And indeed, not many mayors said no to these offers. The real problem: the system is in fact not free. The advertising companies don’t pay anymore for the ads that go with the bike sharing system. In Paris for example, the city could get more than 60 million euros per year for the ads that JC Decaux can show for free now. That’s the price the city pays when it says “free” (and here I haven’t mentioned yet that JC Decaux even managed to renegotiate the contract in 2009 so that the city also gives part of the subscription fees to JC Decaux – to compensate for stolen bikes). The severe fight between Clearchannel and JC Decaux for every new bike sharing contract shows how valuable these extra ad spaces are for these companies. Let’s not forget that these ads all come in addition to existing advertising spaces. So this is practically a really successful land-grabbing exercise for ads in the name of a green mobility policy. One can really only congratulate the people of JC Decaux and Clearchannel for creating such an irresistible offer for municipalities. But let’s not forget that all these free bikes are paid for with our eyeballs and the reinforcement of a large defacto duopoly on outdoor advertising. The solution can only be to split systematically the markets between bike sharing systems and outdoor advertising. This would lead to a more realistic picture of the costs and benefits for the public. PS: In addition to the existing outdoor advertising licence for Brussels and the Villo contract (until 2026! ), JC Decaux has recently won a 12-year advertising licence for the entire STIB public transport network (which was previously handled by STIB and Clearchannel). So Brussels’ eyeballs are all in the hand of one and the same advertising company. Now by the way with even more aggressive digital TV ad boards coming to all metro stations. And how much will the STIB earn from this : around 2 million euros per year. Compare this with the annual debt of STIB which is around 400 million euros and you will see that maybe more often than we think it would be wiser to just pay for the services than to sell our souls and eyeballs. Jon, the problem with Villo is not the public-private partnership (even if I still think that the system should be part of the STIB, as it is clearly a public service the way it is set up) but the fact that the city has concluded a absolutely unbalanced contract with a company that is in fact only interested in the extra advertising space. Sorry to say, but JC Decaux really gives a sh** about the bicycle scheme. The wider topic of this is of course how much ads there should be (and controlled by whom) in public space. Something that I hardly ever see any debate in the public or media. But setting up a (not even free) bicycle sharing system that is paid for by cementing an even wider defacto monopoly of an outdoor advertising company is certainly not the way best way this could have been implemented. And cynically any promotion of its good results (who pays for all the ads that promote Villo during the last year in Brussels btw, I’m sure it’s not JC Decaux) will help the company achieve exactly what it intended in the first place. @Brusselsblogger – very fair points. On your first point – I think this public-private thing is inevitable at the moment. It offers cities a way of getting things done swiftly, without much money direct from the public purse. That issue is a wider one than just bike sharing schemes… But considering Villo! is operated by JC Decaux, and that they operate schemes in Paris and loads of other places too, there might be lessons they have learned! Second – I think Brussels is starting to pilot the systems used in Paris to give you financial bonuses if you return a bike to a station at the top of a hill. First of all, Villo is operated by JC Decaux, the world’s largest outdoor advertising company. They are mainly interested in extra advertising spaces – which they got in Brussels, as every Villo station has a large advertising board integrated (cynically often with ads for cars). Secondly, the transport of bikes is done with trucks (essentially back to the empty stations, which are often up on the hills). Thirdly, the Villo registration system is – as outlined by you – quite complicated. Why is it not simply part of the STIB offer with a MOBIB card being all you need?